Not Enough Resources? – Find Some! With so much going on in the workplace today from new technologies, increasing client requirements, too much data, even more reporting, and of course the human element of wanting to know everything, we are all short of time and resources, because there are not enough hours in the day to get it all done. Sound familiar? It is the world in which we live. If we continue to use legacy behavior we will not get ahead of the productivity curve. This is the definition of insanity – doing the same things over and over and expecting different results. What to do? Stop going to internal meetings! There are too many meetings, they take too long, and they get too little accomplished. Most meetings are really not necessary. Before you call a meeting, think about whether you can accomplish your goals through email or a quick phone call. If it is information sharing only, don’t call a meeting. Meetings are needed to debate issues, develop solutions and make decisions. Do not attend every meeting to which you’re invited. Even if you can’t avoid the meeting completely, it can give you a good excuse for bowing out after a set time limit (30 or 60 minutes, for instance). If a meeting is necessary, invite only those people that are critical to the meeting. Take great notes and send them out to others that you need to “inform”. Smaller meetings with less people are always more productive. Try to get the meeting done in 30 minutes. Make sure there are no laptops open and that people are not using their smartphones. 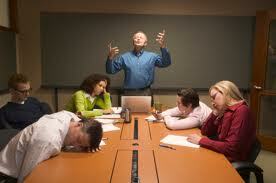 No one can multi-task and stay engaged in the meeting. Have them put these devices in a drawer or box so they cannot access them during the meeting. Take the chairs out of the meeting room; more gets done while standing up. Be prepared. If you spend the first 15 minutes getting everyone up to speed, it gives them an excuse not to be prepared. Send out background materials and an agenda, at least a day in advance. If you do not get the agenda and goals, don’t go. If the leader sends out advance materials, read them carefully before the meeting. If everyone prepares, you can have a more productive meeting. Frame the need and desired state in 5 minutes, debate the issue and make decisions. Lots of powerpoint slides? – forget about productivity – people get bored really fast these days. At the end of any meeting, all participants should agree on the next steps, along with a deadline for each step. The leader should resist the urge to make this decision himself or herself: if participants can set their own goals, they’ll will buy into them. You cannot eliminate meetings totally. But you can get rid of most of them, limit their size, and keep them short. You can structure the meetings to maximize their value. It is up to use to use your time effectively to get your initiatives accomplished. You need to find time to make that happen and following the above recommendations will save you at least 2 hours per day. Imagine what you can get done with that time. Stop the insanity 🙂 Make that change – and that reminds me of a song.